Romney’s birther joke: He isn’t using bigotry against Obama. It just looks that way. 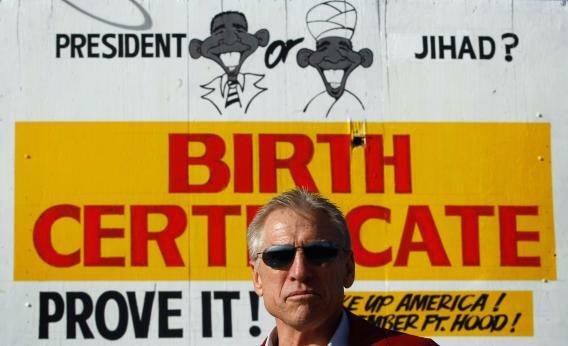 A birther and his billboard, 2009. Why do liberals keep accusing Mitt Romney of playing on bigotry? First they made a fuss when Romney said several times that President Obama “doesn’t understand America.” Then they got upset when Romney said that he, unlike Obama, would “keep America America.” They said “Keep America American” was an old Ku Klux Klan slogan. But Romney didn’t say “Keep America American.” He said “Keep America America.” Anyway, he was talking about culture, not ethnicity. Romney went on to Israel and Poland, turning both countries into campaign ads. Each ad opened with the question: “Who shares your values?” One ad, supposedly an appeal to evangelicals, showed Romney at Biblical sites and noted: “As president, Barack Obama has never visited Israel.” The other ad linked Romney to Pope John Paul II and said, “President Obama used his health care plan to declare war on religion.” But the Anglo-Saxon leg of the trip was never conceived with such a cultural wedge in mind. To suggest otherwise would be outrageous. As we remember and honor the victims and families of the 9/11 tragedy, it’s with that in mind that we have to view the proposal to build the Ground Zero mosque. It’s a very strange enterprise that says we want to increase religious tolerance and understanding, and if you don’t agree with that, we’re going to increase religious tolerance and understanding whether you like it or not. … People are entirely justified in raising questions what the true motives of the mosque’s proponents really are. And if there’s an effort really, at bottom, with people of good will, to increase religious tolerance and understanding, then a way can be found to do that that doesn’t cause the emotional pain that this particular location proposed for the mosque has aroused. But contrary to left-wing critics, Bolton’s speech wasn’t a demagogic play on fear of Muslims. It was just an appeal for sensitivity to non-Muslims. And when Bolton later defended a proposed investigation of Muslims in the U.S. government, his sole concern was national security. That’s why Romney declined to comment on the proposed investigation and continues to use Bolton as a campaign surrogate. Everything Romney and his surrogates say about Obama gets treated as some kind of offense. Not understanding America. Not knowing how to be an American. Growing up in Indonesia. Thinking like a foreigner. Declaring war on our religion. Not sharing our values. Not appreciating our Anglo-Saxon heritage. Not investigating Muslims. Not having a trusted birth certificate. It’s gotten to the point where Romney can’t open his mouth without somebody misconstruing his motives. Poor guy.